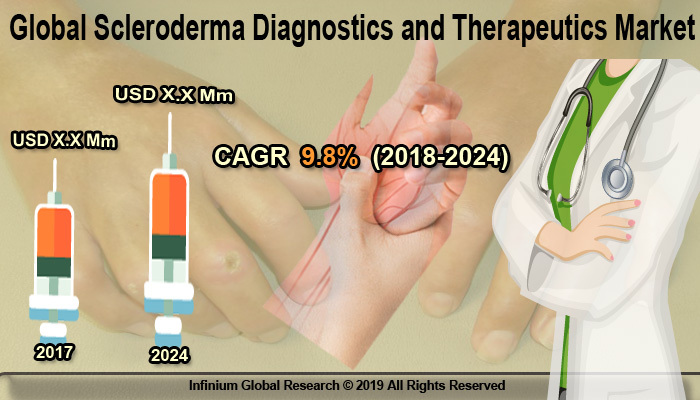 A recent report published by Infinium Global Research on scleroderma diagnostics and therapeutics market provides in-depth analysis of segments and sub-segments in the global as well as regional scleroderma diagnostics and therapeutics market. The study also highlights the impact of drivers, restraints, and macro indicators on the global and regional scleroderma diagnostics and therapeutics market over the short term as well as long term. The report is a comprehensive presentation of trends, forecast and dollar values of global scleroderma diagnostics and therapeutics market. According to the report, the global scleroderma diagnostics and therapeutics market are projected to grow at a CAGR of 9.8% over the forecast period of 2018-2024. Scleroderma is an autoimmune disease that affects the skin and other organs of the body. In scleroderma, the body’s immune system causes inflammation and other abnormalities in the tissues. Further, the skin and connective tissues become tight and hard, causing problems in the kidneys, lungs, internal system, blood vessels, and other areas. Overproduction of collagen results in scleroderma. From newborns to the senior, scleroderma can be developed in every age group. Most frequently, it occurs between 25 to 55 ages. Patients suffering from scleroderma require diagnostic consulting with arthritis specialists, and/or dermatologists. Besides, blood studies and other numerous specialized tests are required depending upon which organs are affected. There are many treatments available to help specific symptoms of scleroderma but there is no cure for this. Moreover, 29th June is known as World Scleroderma Day. The growing incidence of scleroderma and the increasing prevalence of genetic changes are the key factors driving the growth of this market. Further, increasing awareness about preventive healthcare also boost the growth for scleroderma diagnostics and therapeutics market. As per the study, 2.5 million people worldwide have scleroderma, and 19,000 people are diagnosed with scleroderma in the U.K. Moreover, increasing investment in R&D activities related to diagnosis and treatment of scleroderma and the Initiation of new medicines and the existence of disproportionate medical needs will create opportunities during upcoming years. On the contrary, the harmful effects of the drugs, and the high cost of healthcare connected with a diagnostic test of Scleroderma are limiting the growth of the market. Scleroderma is a long-term disease and requires a daily dose of drugs. Among the geographies, North America has dominated the scleroderma diagnostics and therapeutics market in the year 2017. Factors such as the development of new products and the existence of a wide number of clinics drive the growth for scleroderma diagnostics and therapeutics market in the North America region. Moreover, Asia Pacific is expected to grow at the fastest rate during the forecast period due to the existence of favorable government action in supporting scleroderma diagnostics in Japan and Australia. The report on global scleroderma diagnostics and therapeutics market covers segments such as disease indication, drugs, and diagnosis test. On the basis of disease indication, the sub-markets include localised scleroderma, linear scleroderma, and systemic scleroderma. On the basis of drugs, the sub-markets include corticosteroids, calcium channel blockers, chelating agents, endothelin receptor antagonists, immunosuppressive agents, H2 blockers, prostacyclin analogues, proton pump inhibitors, and others. On the basis of diagnosis test, the sub-markets include blood tests, cardiac diagnosis, capillaroscopy, echocardiogram & electrocardiogram, gastrointestinal diagnosis, imaging, skin viscoelasticity, pulmonary diagnosis, and others. The report provides profiles of the companies in the market such as Actelion Pharmaceuticals Ltd, Boehringer Ingelheim International GmbH, Bayer AG, Cytori Therapeutics Inc., Cumberland Pharmaceuticals Inc., Gilead Sciences Inc, Pfizer Inc., Active Biotech AB, Bristol-Myers Squibb Company, and Hoffman La Roche Ltd. The report provides deep insights into the demand forecasts, market trends, and micro and macro indicators. In addition, this report provides insights into the factors that are driving and restraining the growth in this market. Moreover, The IGR-Growth Matrix analysis given in the report brings an insight into the investment areas that existing or new market players can consider. The report provides insights into the market using analytical tools such as Porter's five forces analysis and DRO analysis of scleroderma diagnostics and therapeutics market. Moreover, the study highlights current market trends and provides forecast from 2018-2024. We also have highlighted future trends in the market that will affect the demand during the forecast period. Moreover, the competitive analysis given in each regional market brings an insight into the market share of the leading players.